This version of Texas Chili is hearty, delicious, and totally satisfying. 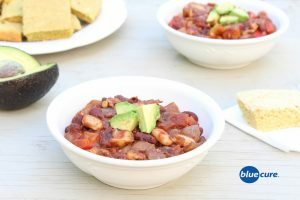 Beans are an excellent source of both fiber and protein– and boost this chili’s nutritional profile to the max. In fact, 1 serving of our chili without the avocado has 18 grams of protein and 16 grams of fiber. It’s a great source of iron, vitamin C, vitamin A, calcium, potassium, magnesium, and a number of other vitamins and minerals. It’s a great option for Meatless Monday— or a meatless meal throughout the week. It pairs great with our Cowboy Cornbread. Give it a try! If you like it, tag us on Facebook or Instagram and tell us! We’d love to hear from you! Wash and chop the potatoes and the onion. Mince the garlic. In a pot, sauté the potatoes, onions, and garlic until the potatoes are soft. Add the beans, tomatoes, tomato paste, vegetable broth, cumin, chili powder, paprika, molasses, pepper, and crushed red pepper to the pot. Cook on medium heat. Continue to stir to avoid burning. In a bowl, crush the walnuts with a fork or the back of a cup. Add the walnuts to the chili. Cook on medium heat until warm. Dish the chili in bowls and top with avocado slices. Serve with a leafy green salad.